You have now assigned users to their correct roles. The meeting moves on to data access review, and you discuss what individual records users should be able to view and edit in each object they have access to on their profile. You have established a baseline level of access so that users have the correct level of access to the records they need. However, the discussion now concerns how this will impact the directors and VPs, who will no longer have all the access they need. From Setup, click Object Manager. Select Create and choose Custom Object. Complete the Custom Object Information for Applicant with these details. Complete the Custom Object Information for Interviewer with these details. Complete the Custom Object Information for Position with these details. Create a status field on the Position custom object. From the Position custom object you just created, click Fields & Relationships. Click New and choose Picklist as the data type. For Field Label, enter Status. For values, select Enter values, with each value separated by a new line. Enter the following values in the box, each value separate by a new line. Select Restrict picklist to the values defined in the value set. Click Next, Next and Save. From Setup, enter Sharing Settings in the Quick Find box, and select Sharing Settings. Click Edit and edit the access settings. Set Applicant, Interviewer, and Position default internal access to private. Click Save. Note: You will receive a notification that your change is being processed, "One or more sharing operations has been initiated. See below for additional details. Certain operations may not be available." Build out the role hierarchy. From Setup, enter Roles in the Quick Find box, and select Roles. Select Set Up Roles and click Expand All. 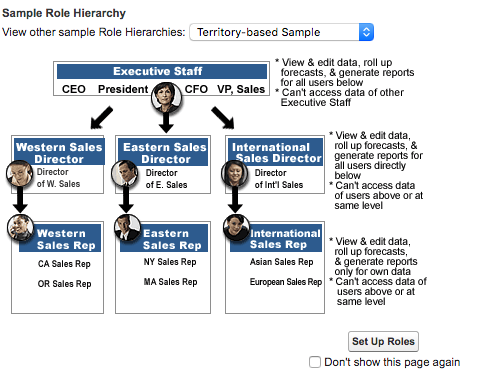 Below CEO, click Add Role, and then complete the new role details. Complete the next new role information. Now that you've set up some new roles, assign them to users. From Setup, enter Roles in the Quick Find box, and select Set Up Roles. Next to VP of Services, click Assign. 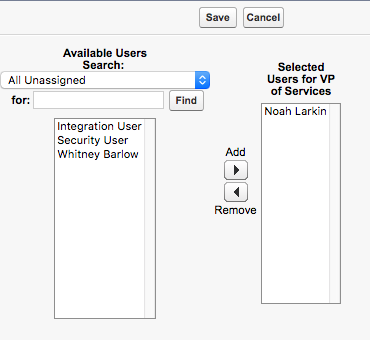 From the Available Users Picklist, select All Users and select Noah Larkin. Next to Accounts Receivable, click Assign. From the Available Users Picklist, select All Users and select Maya Lorrette. Next to Sales Engineer, click Assign. From the Available Users list, select Amy Daniels. Click the and click Save. Repeat the same steps to add Ted Kim to the Recruiter role and your name to the Customer Support Rep role. Great work! You just created custom objects for Applicants, Interviewers, and Positions. Now those records are ready to be shared. In the next step, you set up opportunity sharing rules to allow members of the recruitment team to share information about applicants.